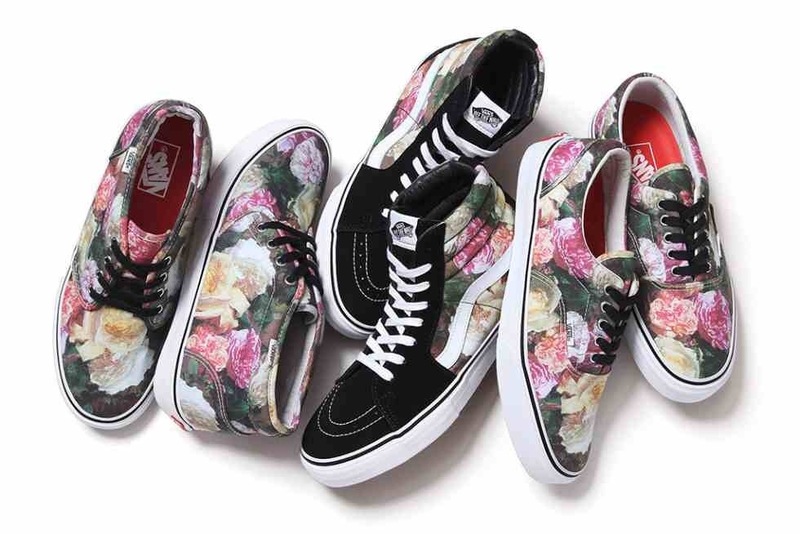 To celebrate the coming solstice, Supreme has released a capsule collection in conjunction with Vans, basking in its skate heritage with an all-over floral print – aptly juxtaposing alternative punk culture with 19th century European art. Here, the popular SK8- Hi, Chukka and Era receive covet renditions courtesy of artwork from New Order’s 1983 album release: Power, Corruption & Lies. The album sleeve was designed by English art director Peter Saville who interpolated his idea from French artist Henri Fantin-Latour’s “A Basket of Roses” painting. The Chukka and Era will feature canvas uppers with leather lining and in-soles, and as usual the SK8-Hi will feature a premium suede toe box and canvas leather accents, rounded up with a white vulcanized sole on all profiles. The capsule collection will be available in-store in NY, LA and London and online on March 7, in addition to availability in Japan from March 9 onwards. This entry was posted in Footwear, Sneakers, Supreme, Uncategorized and tagged Chukka, Corruption & Lies, Era, Kicks, New Order, Peter Saville, Power, Sneakers, Supreme, Trainers, Vans. Bookmark the permalink.